Congress strongman Indranil Rajguru locks horns with soft-spoken CM Vijay Rupani in Rajkot West, while BJP has held seat since 1985. RAJKOT: Stand anywhere in Rajkot and the only thing that repeatedly strikes you amid the sudden cyclonic downpour is Prime Minister Narendra Modi. Take a proper 360-degree view and you will find him all over the city — dominating a skyscraper, looking down from hoardings, some extending the whole length of the road — with messages of vikas (development). Take a closer look, and there is another hoarding right next to Modi’s. That is the Congress seeking to punch holes into the BJP’s claims of ‘vikas’. If the BJP’s hoardings claim “Thayu ne solid kaam’’ (We did solid work), the Congress counters it by asking “Kevi rite kehvu solid kaam?’’ (How can you call it solid work?). It then asks tough questions on problems people are facing. Unlike the rest of Gujarat, where barbs between BJP and Congress candidates are the order of the day, Rajkot is witnessing a bitter poster war on the streets. It is evident that the BJP has worked overtime to saffronise the city where Chief Minister Vijay Rupani and Congress’s Indranil Rajguru are locked in battle from Rajkot West. While Rupani is known to be a soft-spoken man, Rajguru — Gujarat’s richest MLA — comes across as an aggressive and powerful strongman. The going was smooth for the BJP until Rajguru announced that he would contest from Rajkot West — leaving his Rajkot East seat — to take on Rupani. “On the day this announcement was made by Indranil, the BJP became nervous. Since Vijaybhai is a soft-spoken man, the BJP went on an overdrive erecting hoardings, posters, billboards and what not from the next day onwards. Now, wherever you see, you cannot miss Narendrabhai (Narendra Modi),’’ laughs Bhavikbhai, who runs a restaurant which specializes in Kathiyawadi food. To counter Modi, the Congress has erected hoardings right next to the BJP’s. What is striking in these posters is that Rajguru dominates them and Sonia Gandhi and Rahul are missing — possibly, an indication of Rajguru’s clout. If smaller posters of Rupani come with the message “Rajkot Vijay Bhav’’ (Rajkot will win), the Congress is countering them with “Maro mat Rajkot ne, maro mat Indranil ne’’, which translates into “My vote is for Rajkot, my vote is for Indranil”. Both parties seemed to have worked overtime to come up with catchy one liners. If BJP posters with Modi’s photo has the message “Vikas matey vote do” (vote for development), the Congress has come up with “Even after 22 years (of BJP rule), Rajkot gets water for just 22 minutes a day’’. There are also many hoardings with pictures of both Modi and Amit Shah. Only few of them have Rupani’s photo, though there are several small posters of him. The BJP has not lost a single election from Rajkot West — the largest constituency in Saurashtra — since 1985. It was this seat that gave Gujarat three Chief Ministers — Keshubhai Patel, Narendra Modi who won as an MLA from this seat in 2002, and Rupani. Even Karnataka Governor Vajubhai Vala started his political career from here. With nearly 3.10 lakh voters, Rajkot West has close to 43,000 Kadwa Patels while the Leuva Patels have a strength of about 34,000. There are a sizeable number of Kshatriyas, Brahmins and Jains as well. While 51-year-old Rajguru is a Brahmin, Rupani is a Jain. What makes the contest interesting is the support for Patidar Anamat Andolan Samiti leader Hardik Patel. Each time he has held a rally here, it has got a huge response, bothering the BJP. “Hardik Patel has a good support base in Rajkot, though there is a division among the Patidars whether to back him. Many are wary of the Congress with whom Hardik has joined hands. He is likely to make a dent in votes that have traditionally gone to the BJP. He may swing about 10 to 12 per cent votes that were with the BJP,’’ says Ahmedabad-based analyst, Jaibhai Patel. He said Hardik’s support had given a boost to Rajguru. ‘’That explains the poster wars and total dependency on Modi to win the Rajkot West seat,’’ he said. 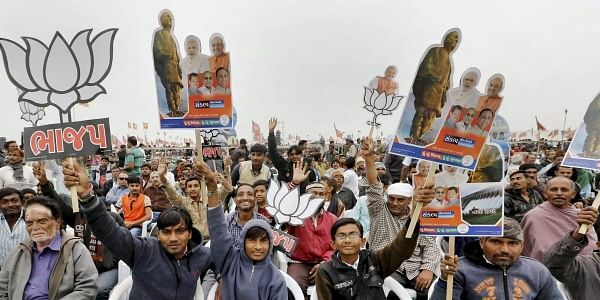 Locals said that though Modi has an emotional connect with the city, it has not developed on a par with Ahmedabad or Surat. “Unemployment and water are the biggest issues here. Many of us have hopes on Narendrabhai but the younger generation of voters may think differently. There are a lot of civic problems like traffic issues, haphazard parking and the magnitude of these problems is far less in Ahmedabad or Surat,’’ says 52-year-old Manikbhai Patel, who lives close to Jawahar road in the heart of the city. His friend, Vimalbhai, said most people will vote for Modi and not Rupani. “But Rajkot needs development on a par with Ahmedabad. Narendrabhai can do it,’’ he said. While CM Vijay Rupani has promised 24 hour water supply for Rajkot in the next five years, Indranil says that despite Rajkot giving three chief ministers, Rajkot has not developed like Ahmedabad or Surat. There is a lack of infrastructure, he said. Rajkot is the fourth-largest city in Gujarat after Ahmedabad, Surat and Vadodara. Water supply and jobs are the major issues this election.